I’d like to thank Dominic not only for what he did, but also for reinforcing an important point about recognition and motivation. Let me explain. There is a retirement complex near our house that has a nice big meeting room that Linda likes to use for her larger stamping classes. Many factors make this a nearly ideal location. First, the location-very close to the house. The room itself is nice and big, not terribly expensive and there is plenty of parking. Also, the residents and the people working there are very nice. One issue we’ve noticed has to do with communication (like many organizations). Linda would relay her wishes for the room set-up to management, but it seemed rare that the persom actually setting up the room got the information. This lead to multiple levels of frustration. Linda, because the room wasn’t set correctly, and any number of employees who had the responisibility (but not the correct information) to set-up the room. Today was different. Today we met Dominic. We arrived at the room to find all the tables and chairs in the exact configuration we had requested. The projector screen was even set-up, and in the right spot in the room. We were in awe. We were overjoyed. Our first encounter with Dominic personally was a few minutes after we arrived. He stopped by to check on us and introduce himself. Even more impressive was the fact that in his hand was the diagram Linda and I had drawn the last time we used the room. Amazing what happens when the right information gets in the right hands. This is where the reinforement comes in regarding recognition and motivation… As he left, he asked if we could let his manager know that things were done right. We said of course. So what is Dominic motivated by? You guessed it- confidence in a job well done and acknowledgement from his managers. Did he ask for money? A trophy? A free meal? No, and yet that’s what we often think motivates people. People really don’t work harder for things, they work harder for people. Don’t let your Dominics get away by mistaking a free meal with REAL motivation that only you can provide. Recently my wife and I discovered bird watching. We find we are particularly drawn to raptors, or birds of prey. We have a family of red-shouldered hawks that live near us and it’s fascinating to watch as they “make their way in the world today”. 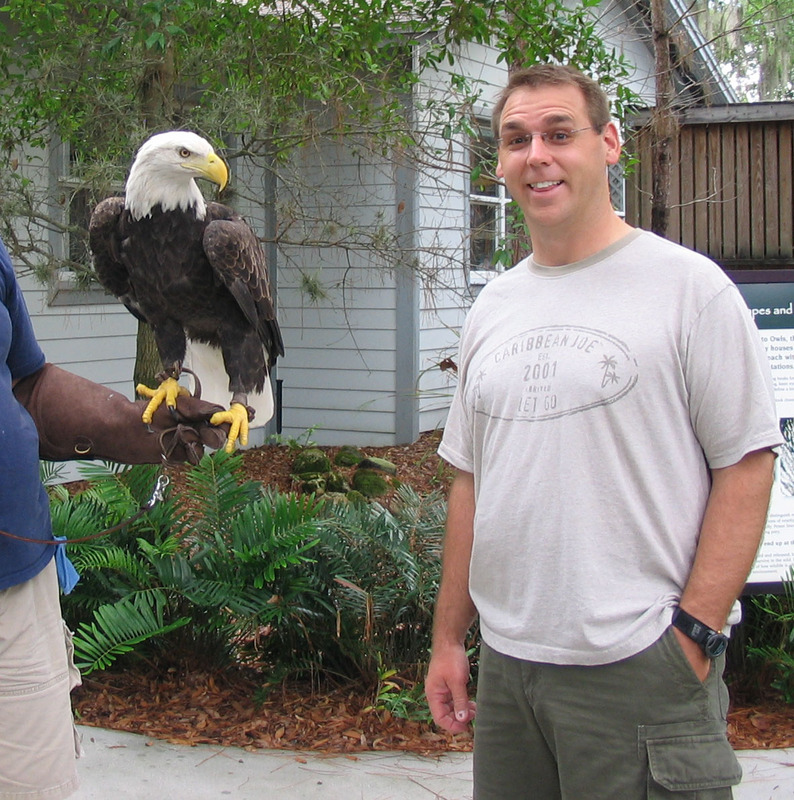 And that’s me with Paige, a bald eagle being rehabilitated at the Audubon Center for Birds of Prey in Maitland, FL. Sometime last year, Linda found a website of “eagle cams“, where you can watch, up close and personal, a family of bald eagles build a nest, hatch a clutch, raise the babies and teach them the ways of the world. It was the story of Tiny, the runt of the litter last year, that really caught my attention. Tiny was, well, tiny. Smallest chick in the clutch, not very strong and destined for malnutrition. Instead of giving him special attention and extra care, (which the other chick would surely resent) mama eagle made Tiny fight for food and his place in the clutch. It may have seemed cruel and unfair to watch, but in the end Tiny was stronger, and ultimately survived, because of it. This brings to mind a phrase most of us have heard in many variations, but the original is credited to the German philosopher, Friedrich Nietzsche. Mama eagle knew that Tiny needed physical strength, confidence, and the ability to stand up for himself – not pity. She put him in situations where he HAD to fight. He had to scrap it out with his brothers and sisters in order to survive. She tested him, and if he didn’t do well on the test there would be no awkward report card discussion… the consequences were much more severe than that. White I certainly don’t advocate keeping food from your employees, I do think leaders have a responsibility to develop the skills and abilities employees need to be confident and responsible. Sometimes this might be viewed as cruel from the outside, but life lessons are often not the most pleasing experiences. Better to go through a “controlled burn” (to borrow a phrase from NASA) than to learn things “the hard way”. I have a friend who is viewed (from the outside of his circle) as someone who doesn’t do much and is constantly dumping his work on the people that report to him. The reality is that the people that have worked for him in the past typically move on faster (and to higher positions) not to get away from him, but because they have the skills to do so. He challenged them to try new things and jump into unfamiliar territory, and then made sure they learned something from each experience. They became stronger, and ultimately survived, just like Tiny. Here’s to you, Tiny, for passing the test! Can you make a second first impression? As I was growing up, I’ll be honest that I wasn’t much of a reader. Summer reading lists for school didn’t interest me and it seemed like the only I thing I would read cover-to-cover was Modern Drummer magazine. So surprise of all surprises that in 2010 I have already finished two books and am working on a third. The Kindle app for the iPhone has certainly helped. One of the books I most recently finished was “The 4 Hour Workweek” by Tim Ferriss. I was intrigued by the title, and wanted to see what his secret was. Turns out it’s A LOT about eliminating time wasters, automating as many processes as possible and finding a business model that can be run from anywhere in the world. There was also a lot of practical advice about getting out of the mindset that you HAVE to work a lot of hours to be productive – sometimes the most difficult hurdle to overcome. And… while I am still working more than 4 hours per week, I have adopted some of Tim’s concepts to make my life more efficient, giving me more time to do the things I want to do. At this point in our story, my only exposure to Tim was through his writing, and I would say it was a positive first impression. Then I heard him speak. I saw a video on his blog where he and a friend were recounting their favorite places in the world to visit, and I felt like he came off as a little pompous, holier than thou, and quite cocky – not a positive second impression – at first. I thought again about my own perception of why I felt this way. I think I was a little jealous that he had: A. the kind of time to go to all these places, B. the money to go to all these places, and C. time to pontificate about them on a video. Had I not read his book, pompous Tim would be the impression that stuck with me. If I were thinking of getting his book, I probably wouldn’t have. But I had read his book, and his writing had had a positive impact on me. So I gave this video, and pompous Tim a second chance. This time I have to say my perception changed. I realized he was just living the lifestyle he talked about creating in his book, and that if anything, this should lend credibility to what he was prescribing. Looking back, Tim really made three first impressions on me. I call them first impressions because they were each powerful enough to change my previous perception. While we can’t completely control what others think of us, we can control how open our mind is to letting people prove themselves beyond the first meeting. How often do we learn everything we need to know about a person from ONE first impression? I would go out on a limb and say… never. My wife and I have recently completed a major kitchen overhaul, so it is now time for me to learn how to cook using more than a microwave, toaster oven and a phone. So far I am enjoying the experience, with one small exeption. For Christmas, my father-in-law got me some really nice, high quality, SHARP knives. Did I mention they were sharp? The other day I was cleaning one of the new pieces of cutlery when it slipped and sliced my right index finger. And I mean sliced! Luckily it was right over the sink so the clean-up was easy…after I got the bleeding to stop. So now I have a painful cut in a very inconvenient spot. Being right handed, there doesn’t seem to be any shortage of places to bang a recently lacerated digit. The spot that seems MOST painful is the small space my fingers must occupy when I start my car. It’s a rub AND a bumping motion all at once. Good times. I have learned very quickly to avoid the pain, I need to reach for and turn the key a little differently. Pain created change. Often, we fear change because we think it will cause some sort of pain. Maybe not physical pain, but uncomfortable-ness, awkwardness or uneasiness. It’s not until the pain not to change becomes greater than the pain to change that we see a desire to do something different. If I’ve learned one thing from this episode, it’s that we don’t have to wait for outside influences to cause pain before we make a change for the better. Do it now. What’s one thing you would like to change, and what are you waiting for?